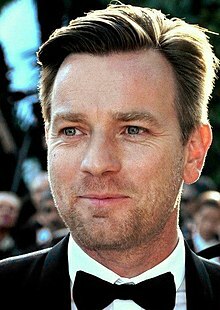 Ewan Gordon McGregor OBE (born 31 March 1971) is a Scottish actor and director, known internationally for his various film roles, including independent dramas, science-fiction epics, and musicals. McGregor's first professional role was in 1993, when he won a leading role in the British Channel 4 series Lipstick on Your Collar. Some of his best known roles include heroin addict Mark Renton in the drama films Trainspotting (1996) and T2 Trainspotting (2017), Jedi Obi-Wan Kenobi in the Star Wars prequel trilogy (1999–2005), poet Christian in the musical film Moulin Rouge! (2001), young Edward Bloom in Big Fish (2003), Rodney Copperbottom in Robots (2005), Camerlengo Father Patrick McKenna in Angels and Demons (2009), "the ghost" in Roman Polanski's political thriller The Ghost Writer (2010), Dr. Alfred Jones in the romantic comedy-drama Salmon Fishing in the Yemen (2011), Lumière in a live-action adaptation of the musical romantic fantasy Beauty and the Beast (2017), and the adult version of the titular character in the fantasy comedy-drama Christopher Robin (2018). In 2018, McGregor won a Golden Globe Award for Best Actor – Miniseries or Television Film for his performance as brothers in the third season of FX anthology series Fargo, and received Golden Globe nominations for Best Actor – Musical or Comedy for both Moulin Rouge! and Salmon Fishing in the Yemen. McGregor has also starred in theatre productions of Guys and Dolls (2005–07) and Othello (2007–08). He was ranked number 36 on Empire magazine's "The Top 100 Movie Stars of All Time" list in 1997. In a 2004 poll for the BBC, McGregor was named the fourth most influential person in British culture. McGregor has been involved in charity work and has served as an ambassador for UNICEF UK since 2004. In 2013, he was appointed an Officer of the Order of the British Empire (OBE) for services to drama and charity. In 2016, he received the BAFTA Britannia Humanitarian Award. McGregor was born in Perth and raised in Crieff. His mother, Carol Diane (née Lawson), is a retired teacher at Crieff High School and latterly deputy head teacher at Kingspark School in Dundee. His father, James Charles Stewart "Jim" McGregor, is a retired physical education teacher and careers master at Morrison's Academy in Crieff. He has an older brother, Colin (born 1969), a former Tornado GR4 pilot in the Royal Air Force. His uncle is actor Denis Lawson and his aunt by marriage was actress Sheila Gish, which makes him a step-cousin of Gish's actress daughters, Kay Curram and Lou Gish. McGregor attended the independent Morrison's Academy in Crieff. After leaving school at the age of 16, he worked as a stagehand at Perth Theatre and studied a foundation course in drama at Kirkcaldy College of Technology, before moving to London to study drama at the Guildhall School of Music and Drama when he was 18 years old. McGregor at the premiere of The Men Who Stare at Goats at the Toronto International Film Festival in September 2009. Six months prior to his graduation from Guildhall, McGregor won a leading role in Dennis Potter's six-part Channel 4 series Lipstick on Your Collar (1993). Not long afterwards, he starred in the BBC adaptation of Scarlet and Black (also 1993) with a young Rachel Weisz, and made his film debut in Bill Forsyth's Being Human (1994). For his role in the thriller Shallow Grave (also 1994), he won an Empire Award. The film was his first collaboration with director Danny Boyle. His international breakthrough followed with the role of heroin addict Mark Renton in Boyle's Trainspotting (1996), an adaptation of Irvine Welsh's novel of the same name. McGregor played the male romantic lead role in the British film Little Voice (1998). He was cast as the young Obi-Wan Kenobi in Star Wars: Episode I – The Phantom Menace (1999); the character was originally played by Sir Alec Guinness in the first Star Wars trilogy. While the prequels received criticism from some Star Wars fans, McGregor's performance was well received. He reprised the role of Obi-Wan Kenobi for the subsequent prequels Star Wars: Episode II – Attack of the Clones (2002) and Star Wars: Episode III – Revenge of the Sith (2005). His uncle, Denis Lawson, had played Wedge Antilles in the original trilogy. McGregor starred in Moulin Rouge! (2001) as the young poet Christian, who falls in love with the terminally-ill courtesan Satine (Nicole Kidman). He starred alongside Renée Zellweger in Down With Love (2003). He also portrayed the younger Edward Bloom in the critically acclaimed film Big Fish (2003) alongside Albert Finney, Jessica Lange, Alison Lohman and Billy Crudup. In the same period, he also received critical acclaim for his portrayal of an amoral drifter mixed up with murder in the drama Young Adam (also 2003), which co-starred Tilda Swinton. McGregor voiced two successful animated features; he played the robot Rodney Copperbottom in Robots, which also featured the voices of Halle Berry and Robin Williams, and he voiced the lead character in Gary Chapman's Valiant (both 2005), alongside Jim Broadbent, John Cleese and Ricky Gervais. Also around this time, McGregor played two roles — one a clone of the other — opposite Scarlett Johansson in Michael Bay's science fiction action thriller film The Island. He also headlined Marc Forster's 2005 film Stay (both 2005), a psychological thriller co-starring Naomi Watts and Ryan Gosling. He narrated the Fulldome production Astronaut (2006), created for the National Space Centre. Around the same time, he also narrated the STV show JetSet (also 2006), a six-part series following the lives of trainee pilots and navigators at RAF Lossiemouth as they undergo a gruelling six-month course learning to fly the Tornado GR4, the RAF's primary attack aircraft. McGregor starred opposite Colin Farrell in the Woody Allen film Cassandra's Dream (2007), and he co-starred with Jim Carrey in I Love You Phillip Morris and appeared in Amelia (both 2009) alongside Hilary Swank. He played "the ghost" — the unnamed main character — in Roman Polanski's political thriller The Ghost Writer (2010). He portrayed Camerlengo Patrick McKenna in Angels & Demons (also 2009), the film adaptation of Dan Brown's novel of the same name. In 2011, McGregor starred in the British comedy Salmon Fishing in the Yemen directed by Lasse Hallström and co-starring Emily Blunt and Kristin Scott Thomas, for which his performance nabbed a Golden Globe Award for Best Actor – Motion Picture Musical or Comedy nomination. At the same year, he was awarded with the SIFF Golden Space Needle Award for Outstanding Achievement in Acting at the 2011 Seattle International Film Festival. In 2012, he was a member of the Jury for the Main Competition at the 2012 Cannes Film Festival. At the San Sebastián International Film Festival, he was awarded the Donostia Lifetime Achievement Award and became the youngest recipient of the award. In 2013, McGregor starred alongside Meryl Streep and Julia Roberts in August: Osage County, which was based on Tracy Letts's Pulitzer Prize-winning play of the same name. McGregor starred in the action comedy film Mortdecai (2015), alongside Johnny Depp and Paul Bettany. Robbie Collin of The Daily Telegraph felt the film was "psychotically unfunny". He made his directorial debut with American Pastoral (2016), in which he also starred. In 2017, he reprised his role as Mark Renton in T2 Trainspotting. McGregor played Lumiere in the live action adaptation of Disney's Beauty and the Beast, directed by Bill Condon with an ensemble cast featuring Emma Watson in a leading role alongside Dan Stevens, Luke Evans, Kevin Kline, Josh Gad, Stanley Tucci, Ian McKellen, and Emma Thompson. Filming began in May 2015 at Shepperton Studios in London, and the movie was released in March 2017. He then starred in FX anthology series in the third season of Fargo (both 2017), which garnered him a Golden Globe Award for Best Actor – Miniseries or Television Film for his dual performance of Emmit Stussy and Ray Stussy at the 75th Golden Globe Awards. In 2018, McGregor starred as the adult version of the titular character in Christopher Robin, a live-action adaptation of Disney's Winnie the Pooh franchise directed by Marc Forster and starred alongside Hayley Atwell. McGregor will next be seen as the older Danny Torrance in the film adaptation of Stephen King's novel Doctor Sleep. He will also star opposite Margot Robbie in Warner Bros.' DC Comics film Birds of Prey (and the Fantabulous Emancipation of One Harley Quinn), directed by Cathy Yan, as the main villain Roman Sionis / Black Mask. From November 1998 to March 1999, McGregor starred as Malcolm Scrawdyke in a revival of David Halliwell's Little Malcolm and His Struggles Against the Eunuchs, directed by his uncle, Denis Lawson. The production was first staged at the Hampstead Theatre before transferring to the Comedy Theatre in London's West End. In November 2001, McGregor made a cameo appearance in The Play What I Wrote. From June 2005 to April 2007, McGregor starred alongside Jane Krakowski, Douglas Hodge and Jenna Russell in the Donmar Warehouse revival of Guys and Dolls after it transferred to the Piccadilly Theatre in London. He played the leading role of Sky Masterson. McGregor received the LastMinute.com award for Best Actor for his performance in 2005, and he was nominated for a Laurence Olivier Award for Best Actor in a Musical in 2007. A motorcyclist since his youth, McGregor undertook a marathon international motorbike trip with his best friend Charley Boorman and cameraman Claudio von Planta in 2004. From mid-April to the end of July, they travelled from London to New York via central Europe, Ukraine, Kazakhstan, Mongolia, Russia, Canada and the United States on BMW R1150GS Adventure motorbikes, for a cumulative distance of 22,345 miles (35,960 km). The trip included visits to several UNICEF programs along the route, and formed the basis of a television series and a best-selling book, both called Long Way Round. McGregor married Eve Mavrakis, a French-Greek Jewish production designer whom he met on the set of Kavanagh QC, in 1995. Together they have four daughters, one of them adopted from Mongolia. McGregor has a heart and dagger tattoo of the names of his wife and daughters on his right arm. The family lived in Los Angeles, California, having relocated from North London. With his children raised in Mavrakis's Jewish faith, McGregor has said, "My involvement in religion has more to do with the Jewish faith now and not the Christian faith, which I was very vaguely brought up in". In May 2017, he left his wife for actress Mary Elizabeth Winstead, whom he met on the set of season 3 of Fargo in which they starred together. On 19 January 2018, McGregor filed for divorce from his wife, citing irreconcilable differences. McGregor is involved in charity work, including UNICEF UK since 2004 and GO Campaign. During the Long Way Round journey in 2004, McGregor and his travelling companions saw some of UNICEF's work in Ukraine, Kazakhstan, and Mongolia, and during the Long Way Down trip in 2007, he and Charley Boorman did some work for UNICEF in Africa. McGregor hosted the annual Hollywood gala for the GO Campaign in 2009 and 2010. He has worked with the Children's Hospice Association Scotland, as featured in Long Way Down. In 2012, he travelled with UNICEF immunization workers to remote parts of India, Nepal and the Republic of Congo for a BBC2 documentary entitled Ewan McGregor: Cold Chain Mission. In June 2015, McGregor read Hans Christian Andersen's "The Little Match Girl" for the children's fairytales app GivingTales in aid of UNICEF, together with other prominent figures such Roger Moore, Stephen Fry, Joan Collins, Joanna Lumley, and Michael Caine. In 2007, on an episode of Parkinson, McGregor said he had given up alcohol after a period where he was arguably a functioning alcoholic, and that he had not had a drink in seven years. In 2008, he had a cancerous mole removed from below his right eye. In 2010, McGregor was appointed by the French government as a Chevalier dans l'Ordre des Arts et Lettres (Knight of the Order of the Arts and Letters). McGregor was appointed an Officer of the Order of the British Empire (OBE) in the 2013 New Year Honours for services to drama and charity. "Choose Life" with PF Project, Trainspotting#2: Music from the Motion Picture, Vol.#2, 1997. "Be Our Guest" with Emma Thompson, Ian McKellen, and Gugu Mbatha-Raw, Beauty and the Beast, 2017. "Days in the Sun" with Adam Mitchell, Stanley Tucci, Ian McKellen, Emma Thompson, Emma Watson, Audra McDonald, Clive Rowe, Beauty and the Beast, 2017. "Something There" with Emma Watson, Dan Stevens, Ian McKellen, Emma Thompson, Nathan Mack, Gugu Mbatha-Raw, Beauty and the Beast, 2017. "The Mob Song", with Luke Evans, Josh Gad, Emma Thompson, Ian McKellen, Stanley Tucci, Nathan Mack, & Gugu Mbatha-Raw, Beauty and the Beast, 2017. ^ a b c d McGregor, Ewan Gordon. ukwhoswho.com. Who's Who. 2015 (online Oxford University Press ed.). A & C Black, an imprint of Bloomsbury Publishing plc. ^ a b c d e f g h i "Profile – Ewan McGregor". Hello!. Archived from the original on 20 August 2008. Retrieved 9 July 2008. ^ Smith, Tony (12 February 2004). "iPod designer voted UK's most influential cultural icon". The Register. Retrieved 17 November 2016. ^ "iPod designer leads culture list". BBC News Online. 12 February 2004. Retrieved 17 November 2016. ^ "BAFTA LA To Honor Ewan McGregor At The 2016 British Academy Britannia Awards". BAFTA. 14 September 2016. Retrieved 20 September 2016. ^ The Hollywood Reporter (26 November 2012). "Ewan McGregor on His Career and 'The Impossible'". YouTube. Retrieved 1 July 2015. ^ "Ewan McGregor 1971". Perth & Kinross Council. Archived from the original on 1 July 2015. Retrieved 30 June 2015. ^ "Starring role for actor's mother Maternity unit closure puts Mrs McGregor in front of the spotlight". The Herald. Glasgow. 31 October 2000. Retrieved 30 June 2015. ^ Dhingra, Dolly (25 January 1999). "Obi-Wan Kenobi's mum". The Guardian. London. Retrieved 30 June 2015. ^ "Carol McGregor: Malawi Diaries". The Scotsman. Edinburgh. 12 August 2007. Retrieved 30 June 2015. ^ "Morrisonian Club". Morrison's Academy. Retrieved 30 June 2015. ^ "Ewan McGregor biography". Tiscali.co.uk. Archived from the original on 8 October 2007. Retrieved 15 January 2008. ^ "Ewan McGregor Biography (1971–)". Film Reference.com. Retrieved 15 January 2008. ^ Barratt, Nick (11 November 2006). "Family Detective". The Daily Telegraph. London. Retrieved 22 January 2018. ^ "He is the actor formerly known as Denis Lawson. Now he's more famous as Ewan McGregor's uncle. But he's not bitter". The Herald. 18 May 2001. Retrieved 14 May 2017. ^ Jinman, Richard (3 June 2005). "The Guardian profile: Ewan McGregor". The Guardian. Retrieved 1 July 2015. ^ "Perth Theatre, past and present..." Perth Concert Hall. Archived from the original on 1 July 2015. Retrieved 1 July 2015. ^ a b c "Filmography – Ewan McGregor". Hello!. Retrieved 9 July 2008. ^ "Empire Awards, UK: 1996". IMDb.com. Retrieved 9 July 2008. ^ Shepherd, Jack (13 October 2016). "Star Wars: Ewan McGregor wants to return as Obi-Wan Kenobi". The Independent. ^ Star Wars Episode III: Revenge of the Sith – Web Documentaries of Revenge of the Sith DVD (DVD). 20th Century Fox. 2005. ^ Star Wars Trilogy (DVD). 20th Century Fox. 2004. ^ a b "Ewan McGregor Biography". Yahoo!. Retrieved 9 July 2008. ^ Slater, Matthew (9 October 2003). "Young Adam's dark tale". BBC News Online. Retrieved 9 July 2008. ^ Dawtrey, Adam (21 September 2003). "Thomas' distrib misstep". Variety. Retrieved 9 July 2008. ^ Hartlaub, Peter (11 March 2005). "It's a bucket of bolts that rattles agreeably. Robots mingles brass, laughs and, yes, Robin Williams". San Francisco Chronicle. Retrieved 9 July 2008. ^ Holden, Stephen (19 August 2005). "These Brave Pigeons Are Doing Their Part for the War". The New York Times. Retrieved 9 July 2008. ^ Clinton, Paul (22 July 2005). "'Island' just interesting enough". CNN. Retrieved 9 July 2008. ^ Dargis, Manohla (21 October 2005). "Something Is Happening, but Who Knows What It Is?". The New York Times. Retrieved 9 July 2008. ^ "Astronaut with Ewan McGregor". EwanMcGregor.net. 14 July 2006. Archived from the original on 15 June 2008. Retrieved 14 November 2013. ^ "Ground School". STV. 27 July 2007. Archived from the original on 13 January 2009. Retrieved 10 July 2008. ^ Moore, Roger (29 January 2008). ""Dream" gives wakeup call to Woody Allen". Denver Post. Retrieved 9 July 2008. ^ "2011 Golden Space Award for Outstanding Achievement in Acting". Archived from the original on 22 February 2013. Retrieved 25 October 2012. ^ "The Jury of the 65th Festival de Cannes". Cannes Film Festival. Archived from the original on 24 May 2012. Retrieved 25 April 2012. ^ "2012 Donostia Lifetime Achievement Award". BBC News Online. 28 September 2012. Retrieved 25 October 2012. 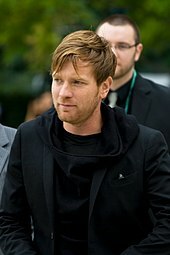 ^ "Ewan McGregor to Play Julia Roberts' Husband in 'August: Osage County'". The Hollywood Reporter. 12 October 2012. ^ Collin, Robbie (22 January 2015). "Mortdecai, review: 'psychotically unfunny'". The Daily Telegraph. Retrieved 6 August 2016. ^ Alm, David. "In Directorial Debut, Ewan McGregor Attempts The Impossible With Philip Roth's 'American Pastoral'". Forbes. Retrieved 31 March 2019. ^ Kit, Borys (4 December 2015). "'Trainspotting 2,' With Original Cast, Lands at TriStar". The Hollywood Reporter. Retrieved 6 August 2016. ^ "Ewan McGregor to Play Lumiere in 'Beauty and the Beast'". The Hollywood Reporter. 21 April 2015. Retrieved 28 April 2015. ^ Mitovich, Matt Webb (7 January 2018). "Golden Globes: Big Little Lies, Handmaid's Tale and Marvelous Mrs. Maisel Are TV's Big Winners". TVLine. Retrieved 8 January 2018. ^ Lesnick, Silas (26 April 2017). "Ewan McGregor Will Headline Disney's Christopher Robin Movie". Comingsoon.net. Retrieved 26 April 2017. ^ Kroll, Justin (13 June 2018). "Ewan McGregor to Star in New 'Shining' Movie 'Doctor Sleep' (EXCLUSIVE)". ^ D'Alessandro, Anthony (1 November 2018). "Ewan McGregor Joins 'Birds Of Prey' As Villain Black Mask". Deadline.com. Retrieved 1 November 2018. ^ "McGregor play opens in West End". BBC News Online. 22 January 1999. Retrieved 17 December 2011. ^ Wolf, Matt (25 November 2001). "V Legit Reviews: The Play What I Wrote". Variety. Retrieved 17 December 2011. ^ "'Guys and Dolls' musical". Guys and Dolls the Musical. Archived from the original on 4 July 2008. Retrieved 9 July 2008. ^ Singh, Anita (25 October 2005). "McGregor wins theatre award". The Scotsman. Edinburgh. ^ "The nominees and winners of the 2006 Laurence Olivier Awards". The Society of London Theatre. Archived from the original on 5 February 2008. Retrieved 15 January 2008. ^ a b "Ewan McGregor returns to London stage for minimum wage". International Herald Tribune. 12 May 2007. Archived from the original on 3 May 2008. ^ "Ewan McGregor to Play Iago in Othello at London's Donmar". Broadway.com. 11 May 2007. ^ "Long Ride to Self Discovery" (PDF). The Daily Telegraph. 14 October 2004. Archived from the original (PDF) on 28 May 2008. Retrieved 9 July 2008 – via Long Way Around. ^ a b c d e "Ewan McGregor gets back on his bike – this time for BBC Two". BBC Press Office. 15 May 2007. Retrieved 23 January 2008. ^ Ewan McGregor, Charley Boorman, David Alexanian, and Russ Malkin (18 October 2004). "Long Way Round". Long Way Round. 42 minutes in. Sky One. ^ Ewan McGregor, Charley Boorman, David Alexanian and Russ Malkin (28 October 2007). "Long Way Down". Long Way Down. BBC Two. ^ "Ewan McGregor secures sponsorship deal for South American road trip". The Herald. 7 June 2015. Retrieved 7 June 2015. ^ Pfefferman, Naomi (19 October 2016). "Ewan McGregor's Jewish connection to 'American Pastoral'". Jewish Journal. Retrieved 26 May 2018. ^ Schleier, Curt (20 October 2016). "Ewan McGregor's biggest challenge: Philip Roth". Jewish Telegraphic Agency. Retrieved 26 May 2018. "I'm married to a Jewish woman," he said of wife Eve Mavrakis. ^ Macnab, Geoffrey (7 November 2016). "Ewan McGregor interview: 'Trainspotting sequel has a different energy'". The Independent. Retrieved 26 May 2018. ^ Silverman, Stephen M.; Norman, Pete (12 April 2006). "Ewan McGregor Adopts a Daughter". People. Retrieved 9 July 2008. ^ Adams, Cindy (25 May 2011). "Beginning of a new friendship". New York Post. News Corporation. ISSN 1090-3321. Retrieved 28 May 2011. ^ White, Gemma (31 July 2012). "Celebrity adoptions: Love sees no colour". Scene magazine. Retrieved 17 April 2013. ^ "Ewan McGregor Tattoo Pictures". Ready2Beat. Retrieved 22 February 2011. ^ Khokhar, Ahmer (1 August 2010). "'London eats liberty', says Ewan McGregor". The Scotsman. Edinburgh. Retrieved 8 September 2011. ^ Yamato, Jen (8 May 2016). "Ewan McGregor on How a Non-Believer Found Jesus in 'Last Days in the Desert'". The Daily Beast. Retrieved 21 December 2016. ^ Jordan, Julie; Pasquini, Maria (23 October 2017). "Ewan McGregor Splits From Wife of 22 Years". People. Retrieved 7 December 2017. ^ Hearon, Sarah (19 January 2018). "Ewan McGregor Files for Divorce From Wife After 22 Years of Marriage". Us Weekly. Retrieved 19 January 2018. ^ Warner, Kara (19 January 2018). "Ewan McGregor Files for Divorce From Wife of 22 Years Eve Mavrakis: Report". People. Retrieved 22 January 2018. ^ "Ewan McGregor: Cold Chain Mission in the Congo". UNICEF UK. Archived from the original on 12 May 2013. Retrieved 27 April 2012. ^ Dredge, Stuart (18 June 2015). "Roger Moore backs children's fairytales app in aid of Unicef". The Guardian. ^ "McGregor fine after cancer scare". BBC News Online. 22 April 2008. Retrieved 22 April 2008. ^ "Remise des insignes de chevalier dans l'ordre des Arts et Lettres à Jim Carrey et à Ewan McGregor". French Ministry of Culture (in French). Retrieved 15 September 2017. ^ "Award of insignia of Knights of the Order of Arts and Letters to Jim Carrey and Ewan McGregor". French Ministry of Culture. Retrieved 15 September 2017. ^ "New Year Honours 2013: At a glance". BBC News Online. 29 December 2012. Retrieved 29 December 2012.